Priorities for combating pandemic influenza include rapid detection and identification, the quick administration of available drugs to treat the infection, the development of new antivirals, and the development of vaccines. Since lead-time may be required to produce an effective vaccine, antivirals would serve as a key first line of defense in containing an outbreak. Diverse antivirals, acting through different mechanisms, would help stay the development of resistant viruses. 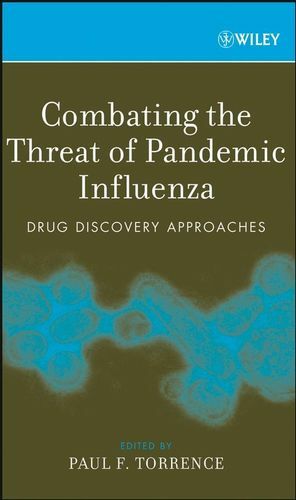 Thus, drug discovery for influenza antivirals is an important public health-related endeavor. Combating the Threat of Pandemic Influenza: Drug Discovery Approaches consolidates the latest information on diverse approaches into one comprehensive resource. It is an invaluable, hands-on reference for researchers in medicinal chemistry, pharmaceutical chemistry, drug discovery, biochemistry, virology, microbiology, and public health. Paul F. Torrence, PhD, joined the National Institutes of Health in 1969 and served as Chief of the section on Biomedical Chemistry at the National Institute of Diabetes and Digestive and Kidney Diseases from 19891999. From 19992007, he was a Professor of Chemistry and Biochemistry at Northern Arizona University where he taught organic, bioorganic, and medicinal chemistry, as well as drug discovery.Professor Torrence's research pursued drug discovery for the diseases of smallpox, HIV, West Nile Virus, and cancer with grant support from the National Institutes of Health, Department of Defense Congressionally Directed Medical Research Program, the U.S. Army Institute of Infectious Diseases, the Arizona Disease Control Research Commission, Arizona Proposition 301 funds, and Research Corporation. Presently he is Emeritus Professor of Chemistry and Biochemistry at Northern Arizona University. 1. Existing Influenza Antivirals: The Mechanisms of Action and Potential in the Face of Avian Influenza (Erik De Clercq). 2. Development of High-Throughput Screening Assays for Influenza (Diana L. Noah, E. Lucile White, and James W. Noah). 3. Mechanisms of IFN Resistance by Influenza Virus (Heather J. Ezelle and Bret A. Hassel). 4. Broadly Effective Anti-Respiratory Virus Agents (Shiro Shigeta). 5. Current Status on Development of Nucleic Acid-based Antiviral Drugs Against Influenza Virus Inefection (Jonathan P. Wong, Mary E. Christopher, Murray Cairns, L.-Q. Sun, Roderic M.K. Dale, and Andres M. Salazar). 6. Antiviral RNA Interface Strategies Targeting Influenza Virus and Other Respiratory Viruses (Joost Haasnoot and Ben Berkhout). 7. Promising Antiviral Glyco-molecules from an Edible Alga (Toshimitsu Hayashi, Kyoko Hayashi, Kenji Kanekiyo, Jung-Bum Lee, Takahisa Nakano, and Minoru Hashimoto). 8. Rational Design of an Anti-Adhesion Drug for Influenza (Nicolai V. Bovin and Alexandra S. Gambaryan). 9. Understanding Influenza Neuraminidase Inhibitors Using Quantitative Structure - Activity Relationship (QSAR) Models (Rajeshwar P. Verma and Corwin Hansch). 10. Peptide Inhibitors Targeting Virus-Cell Fusion in Class 1 Enveloped Viruses (George F. Gao). 11. Novel Influenza Therapeutics (Laura M. Aschenbrenner, Nicole Pelletier, Mang Yu, and Fang Fang).